On Sunday, May 18, 2008 from 2 - 4pm pre-school and young school age children and their care-givers are invited to the Audubon Center in Prospect Park for a FREE event. 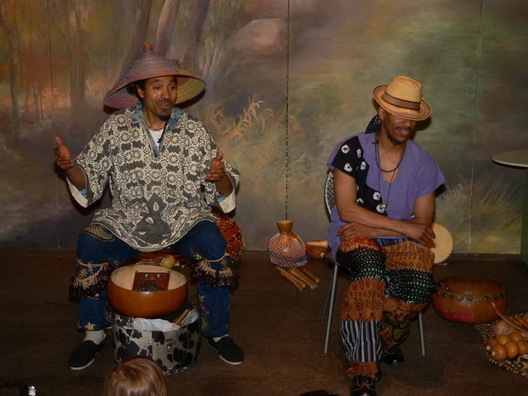 Musicians and storytellers Hasan Bakr and Kevin Nathaniel will introduce the children to the sounds of Africa and the African diaspora through the story of a young musician, a magician, and how they save their village from the evil giant Abiyoyo. Instruments include the djembe, mbira, bongo, and shekere. After the performance children are invited to take part in a craft activity inspired by the Abiyoyo story. Free copies of the book “Pete Seeger’s Storysong ABIYOYO” will be distributed courtesy of Simon & Schuster, Children’s Publishing Division.